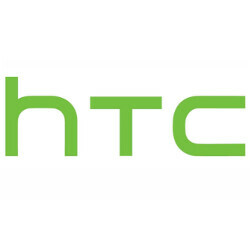 Earlier this month, it appeared that the HTC smartwatch would finally be unveiled after a few false starts. None other than Evan Blass (known in the past by his @evleaks Twitter handle) said that the timepiece would be unveiled during the week of June 6th. 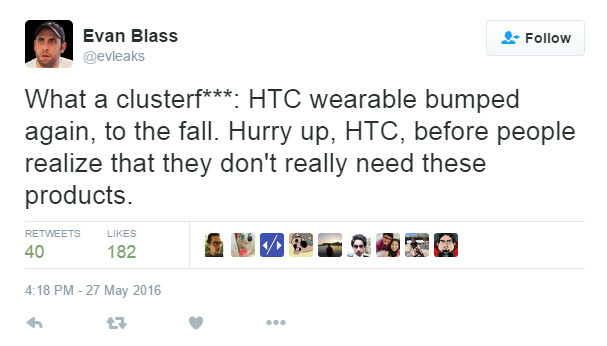 But once again, HTC has decided to delay the introduction of its wearable, according to a tweet from Blass. Now, it isn't expected to see the light of day until the fall. This has been the third or fourth time (we lost count, honestly) that HTC has reportedly been ready to introduce its smartwatch, only to have the unveiling delayed. In September 2014, the manufacturer was said to have pulled the device for good. Four months later, production of the watch was said to be back on. In addition to changing the date, over the years we have been tipped to a change in the device itself. Originally said to feature a square display, the last we heard was that the HTC smartwatch would have a 360 x 360 circular display with the code name of Halfbeak. Scientists tell us that some day the sun will burn out. And diseases that have eluded us for ages, like cancer and diabetes, will have a cure. And perhaps some time in the future, the HTC smartwatch will be unveiled. Take as long as you want. People already realize they are all pretty much a waste of money. Some more than others. Unless you're into fitness and need one specific to that, everything else is basically an expensive useless piece of tech. I would never say they are a waste of money. Some OEMs charge too much. However they can and do offer some great experiences, and they can be quite handy. Without the need to look at smartphone. You can use them to unlock you car door or open your front door, pay for things and more. Battery life won't be up there especially when they are becoming little computers. I agree they are pretty useless and I have owned quite a number of them and sold them all. Unless they can make one that has a full circle, is thin, and has at least 3 days of battery life, I'm not interested. I wish they would make one without all the health and fitness garbage. People use it for a week and forget about it. I LOVE my Huamei Watch, and for me it is a very good purchase. Like I keep my ringer off on my phone at all times. Yet, today someone called and my wrist vibrated so I could answer. I can even answer from the watch. I also like that instead of using google maps on my phone, I can have it on my watch so it is a quick look to the watch instead of walking down the street carrying my phone. ESPECIALLY good when I am in a not the best neighborhood early in the morning. I use it for the fitness tracking too, as others have mentioned. I have also used it to make a purchase from amazon, and listen to music. I flashed the Androidwear 2.0 on it last weekend, and although so kinks need to be worked out, it is great. And finally, WeChat, wechat works SO well on the watch. I'd much rather do a quick reply from the watch, then getting my phone, typing it out, and then putting it back. But, to each their own. True as I dumped my moto 360 ! !